The psychic worlds are so varied that one can only describe them in the most general terms. They have also been called the supernatural worlds, or intermediate worlds by writers who describe their own inner journeys. Traveling in the psychic worlds is sometimes called shamanic journeying by those interested in indigenous societies and their methods of spiritual travel. The psychic worlds can range from very positive, beautiful, and joyous to very negative and hellish. Here I will note that my own experience with these negative areas is very limited and I therefore rely on other author's claims to backup this assertion about the hellish states. Many spiritual leaders claim that enlightenment can come without any involvement with these psychic areas and warn against any contact with these realms. This is partly because contact with the psychic planes is associated with psychic abilities such as predicting the future and telepathy. Such skills have the potential of giving the psychic person power over others, and can be valuable commodities that can be used to make money.  These psychic skills therefore offer great temptations to leave the spiritual life behind. Attempts to turn spirituality into a business though many times well-intentioned are fraught with difficulty, and a significant portion of the New Age subculture has become a gigantic mall with countless shopkeepers selling their spiritual wares. However, spiritual travel only seeks to open the individual to new vistas and is by itself of little help in controlling other people, or in improving the traveler's wealth or position in society. These kinds of new vistas serve as preparation for entering the mystical Oneness which is both the source and final destination of all life. Therefore, the author views encounters with these psychic areas as stepping stones to the spiritual areas, and important parts of a spiritual education rather than threats to the seeker that might lead him or her astray. The Western approach to some Eastern traditions focuses on long periods of meditation where over a period of years the seeker's restless mind is quieted. Using the Buddha's life as a primary example, the tremendous struggle and period of mental discipline is then followed by a grand leap to enlightenment where suddenly all confusion and ignorance is left behind. This is the sudden enlightenment approach. However, in my experience, the spiritual search is much more like learning a craft where the student takes multiple small steps over a period of years which gradually lead to mastering the craft. This gradual approach is consistent with the spiritual travel approach and is also consistent with the way most human beings learn any new field. Spirituality is like playing the piano where the process of learning is sometimes dull, and involves discipline and repetition. However, the piano sonata which finally results from all the practice is sublime and transcends the musician, the practice involved, and the instrument on which it is played. All the seeker needs is to have a few spiritual travel experiences to conclude that in spiritual travel, the Whole is much greater than the some of the parts. The psychic planes are the areas of creativity and individuality. They represent a gradual expansion of identity where the traveler discovers not ultimate freedom but a widening of consciousness to include greater wisdom and freedom. There is a gradual stretching of identity to include awareness of more and more ways of being. The ability to travel outside the body consciously and explore these areas represents a form of freedom and individuality that is unimaginable to those who have not experienced it. The following examples attempt to show a range of states on the more positive end of the psychic spectrum. Mystical literature is replete with stories of mystics claiming to instantaneously learn libraries of information from a single encounter with the inner reality. In this quote, Robert Monroe describes a spiritual travel (OBE) experience where his consciousness is joined with a series of other beings to form a vast reservoir of collective knowledge and experience. The experience comes close to describing what the psychologist Carl Jung called the "collective consciousness" of humanity. This collective consciousness was the locale of archetypal or collective symbols which represent the collective experience of the human race. However, Monroe's experience seems to go beyond Jung's theory, and asserts that the collective consciousness holds the experience of other intelligent non-human species as well. The latter parts of the experience transcend the psychic area and border on a mystical experience. This experience is a common one where a spiritual travel practitioner meditates on the way into sleep. In this case, the individual concentrates on a flat image that becomes three-dimensional as he leaves the body to enter a psychic space represented by the picture. This experience describes the world of Sat Lok ("place of light or purity" in Sanskrit). The more distant psychic worlds have many fascinating heavenly qualities and features which are illustrated in this travelogue. A Description of a Spiritual Travel experience which involved "exquisite touch"
Emanuel Swedenborg describes his experience of being "carried away by the spirit to another place". Annada Thakur was an Indian visionary who considered the dead Indian saint Ramakrishna Paramahamsa of Dakshineswar to be his inner guide (in this account Ramakrishna is called Thakur, or Lord). Annada had been sick and had been musing about his desire to see something of hell before he died. When he fell asleep, he had the following spiritual travel experience. Later, he was shown a series of hells, but this description concentrates on his spiritual flight with his guide and the experience of a heavenly breeze. Black Elk's vision illustrates a shamanic method of inducing spiritual travel. Shamans are priests or healers of tribal peoples who act as go-betweens bringing messages from the ancestors to their tribal group. As a note, many Americans have taken to imitating shamans and their practices but this is a difficult path for those outside these Native American communities. The section titled Shamanic Subcultures and Spiritual Travel discusses this in greater detail. Mandala areas are composed of powerful imagery containing a variety of clear multi-colored moving geometrical forms tied together in an overall circular pattern. In tantric meditation, they are symbolic maps of the heavens. This experience illustrates the malleable nature of some kinds of experience in the psychic worlds. In some states, the reality encountered is plastic and will rapidly reform itself if the traveler has the presence of mind to examine it closely. This power of concentration during spiritual travel has the effect of producing a much wider variety of experience during spiritual travel than is usually present in dreams. The traveler discovers his body appears as a sphere of light as he embarks on a journey to meet his spiritual guide. The experience of synthesia and 360 degree vision illustrates unusual forms of perception while in an out-of-body state. One unusual aspect of spiritual travel is changing the body image to a different form. In this example, the change happens spontaneously but it is likely that some experienced travelers can change bodily forms at will. There are a broad variety of visually interesting spaces to explore in the psychic areas. Exploring the skies of the psychic worlds is a creative outlet which is exciting for the spiritual traveler, and a refreshing alternative to embodied existence.